Structural plastic construction and rounded corners protect against accidental wall and door damage. No bumpers required. Plastic construction will not rust, dent, crack, chip, peel or splinter unlike conventional metal or wood. All Continental platform trucks feature a heavy-duty, reinforced steel handle. Load Capacity: 2200 lbs (997.92kg). Structural plastic construction and rounded corners protect against accidental wall and door damage. No bumpers required. Plastic construction will not rust, dent, crack, chip, peel or splinter unlike conventional metal or wood. All Continental platform trucks come in Granite Gray and feature a heavy-duty, reinforced steel handle. Load Capacity: 1200 lbs (544.32kg). Structural plastic construction and rounded corners protect against accidental wall and door damage. No bumpers required. Plastic construction will not rust, dent, crack, chip, peel or splinter unlike conventional metal or wood. All Continental platform trucks come in Granite Gray and feature a heavy-duty, reinforced steel handle. Load Capacity: 700 lbs (317.52kg). 2 Swivel, 2 Fixed casters. Structural plastic construction and rounded corners protect against accidental wall and door damage. No bumpers required. Plastic construction will not rust, dent, crack, chip, peel or splinter unlike conventional metal or wood. All Continental platform trucks come in Granite Gray and feature a heavy-duty, reinforced steel handle. Load Capacity: 700 lbs (317.52kg). Structural plastic construction and rounded corners protect against accidental wall and door damage. No bumpers required. Plastic construction will not rust, dent, crack, chip, peel or splinter unlike conventional metal or wood. 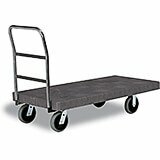 All Continental platform trucks come in Granite Gray and feature a heavy-duty, reinforced steel handle.